No-one is to face charges after the 16-month cash-for-honours police inquiry, the BBC understands. Four people were arrested, including two of Tony Blair's aides, during the £1m probe into whether honours were given in exchange for party donations. Prime Minister Gordon Brown said it was right that police had investigated the "very serious allegations". But he said he hoped the official announcement expected later would bring to an end "months of speculation". Speaking to reporters in Paris, where he is discussing Darfur with French President Nicolas Sarkozy, Mr Brown said he wanted to "move ahead" with reform of political funding. Former prime minister Tony Blair and Labour fundraiser Lord Levy are expected to make statements later. BBC political editor Nick Robinson says Scotland Yard is preparing to make a public defence of its officers. Assistant Commissioner John Yates of the Metropolitan Police - who led the inquiry - has said from the outset his officers were simply doing their jobs by investigating serious allegations. He was backed by Chris Fox, a former president of the Association of Chief Police Officers, who told BBC Radio 4's Today programme: "I'm confident that John Yates and his team will have done everything they possibly could to get to the bottom of the allegations. "When someone makes an allegation like that the police service have to take it seriously." The Crown Prosecution Service is set to announce its decision on Friday but has so far refused to comment. But Downing Street adviser John McTernan, who was among those questioned, told the BBC: "It's a massive relief for everybody involved in this that at last a line can be drawn under it." Asked if he might consider taking action against the police he said: "The police, in my experience, were scrupulously fair in the way they treated me and I believe they did the same with my colleagues. I don't have any question about the way police conducted this investigation. "I think everybody in politics wishes it had been done faster, because ultimately, for the public, it just looks a bit mucky and murky and I don't think anybody who's involved in politics actually genuinely believes that anybody at a senior level in any of the major parties is involved in anything dodgy in relationship to this." Mr Blair's chief fundraiser Lord Levy, his director of government relations Ruth Turner and Labour donor Sir Christopher Evans were all arrested as part of the inquiry into whether people were nominated for peerages in return for donations to political parties. Mr Blair, who was questioned three times as a potential witness, became the first sitting prime minister to be interviewed by police in the course of a criminal inquiry. He is expected to make a statement later, as is Lord Levy. 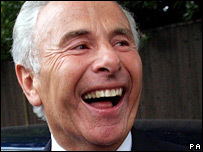 Speaking earlier to reporters outside his London home, a beaming Lord Levy said: "I think my face says how I feel." Deputy Labour leader Harriet Harman said it would not be right to comment on the decision, but said a lot of changes had been made in political funding. "After the allegations, we did change the law to make sure that loans, as well as donations, have to be disclosed and made public. "We've got further discussions going on with the other political parties to make further changes in the funding of political parties. And we're going to reform the House of Lords." Tory leader David Cameron said he would wait for the official announcement by the CPS before commenting but said it was up to the police to decide what to investigate. Scottish National Party MP Angus MacNeil, who made the original complaint to Scotland Yard, told BBC Two's Newsnight the outcome of the investigation was "quite extraordinary". He said: "We've had an investigation going on for the past 16 months, there have been 6,300 documents at the end of that given by the Yard to the Crown Prosecution Service. "The Yard liaised with the CPS through all this, and now it seems the CPS are trying to tell us it's all a wild goose chase." Labour MP and former minister Denis MacShane, who has long been critical of the inquiry, said: "This was always a politically instigated investigation, launched by the Scottish National Party". Liberal Democrat leader Sir Menzies Campbell said the whole affair had "diminished politics and politicians in the eyes of the public". "You have to deal with the question of public confidence. "I think you have got to be totally transparent, you have got to ensure that the regulations that you have are properly enforced, and of course you have to have reform of the House of Lords and, in my view, sensible state support for political parties." But Labour MP Tony Wright, chairman of the Public Administration Committee, told the BBC the investigation had been a "disaster for the police and a disaster for the political system". 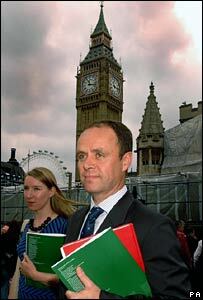 He added: "It's done great damage to our political system. Our system is fundamentally clean. It needs eternal vigilance but basically political issues need to be resolved by the political system."